SUCTION LIFT CAPABILITY from minimum dead volume, slow long stroke and small plunger diameter, there are still - FILLING PROBLEMS - galore! 1 "Pads" of pressurized nitrogen gas are applied to the supply tans, as soon as the pressure falls below the pressure at which the pad saturated the liquid, the gas comes back out of solution, and simulates cavitation so unless you provide a suction boost pump as well, every suction stroke begins with a loss of volume into the pump and a potential fall in output. A blowing agent (like pentane) is chilled and transferred into a supply tank. It warms a little, and the vapor pressure provides a supply "suction head pressure". The liquid is at vapor pressure! The liquid will only move to the pump suction check valve if the pressure at the check valve is lower than where it came from. So at the pump it is below vapor/our pressure. The pump doesn't fill. The height of the tank is enough head to over come the flow friction, most of that benefit is lost by further warming as it travels the pipe. 1) Cooling jacketed damper brings temperature below vapor/our pressure @ temp. 2) The damper sized to recover 96% of the suction mass acceleration head loss. 3) Damper with flow through to save flow reversal loss (that occurs with a "T" connection). AND which keeps the temperature constant - warm in - cool out. 2 THE RULE OF "2:6:3:1" ratio of across sectional areas inside the pipes. More flow and pressure stabilization is achieved by having: 1) A pipe size for 0.6 meters per sec constant velocity to the suction damper. 2) A pipe sized for peak velocity from suction damper to pump inlet check valve. 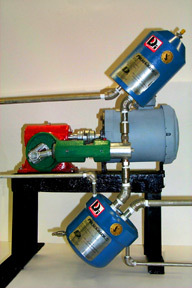 3) Pipe for peak velocity from pump discharge to damper. 4) Sized for 3 meters per sec from damper for the system. 1) The constant velocity caused in the supply line, enables a pipe size reduction, which reduces time in the pipe & so reduces the warming even further. 2) Metering accuracy increase - 9% deviation down to 1/2%, consistent foam, and save excess blowing agent. 3) Stopped "finger pointing" at pump, & didn't need a new one. The root cause of the problems was that because there was an "adequate" difference between NPSHA and NPSHR to cover flow friction, is was assumed that the pump would fill. The NPSH approach assumed that the pump was centrifugal, positive displacement pumps are not centrifugal; reciprocating pumps need to avoid mass acceleration pressure loss for every stroke. A general term for this is "mass acceleration head" meaning pressure difference required to overcome the inertia of weight of the liquid in the pipe. This weight is obtained from the cross sectional area of the flow path, times length, to find volume times the specific gravity / density of the liquid = mass. Rate of acceleration time mass, gives the force = Delta P.
Dampers that do, flow goes through, Pressure problems do not.